John's story shows how La Trobe Financial turned his home ownership to homelessness. It is a sad tale of non-bank home loan fraud, crippling fees and theft. John currently lives in a $150 caravan he managed to get at the tip while the home stolen from him is now valued at around 1.6 million. There needs to be thorough investigation by an extended RC with the power to set in place recommendations for the compensation of individual bank victims and access to affordable and meaningful justice. JK 4 years later buys the friend out with finance from La Trobe Financial. JK told by a broker it had to be a business loan. JK questions the broker as applications states "business loan only if funds are predominantly used for business purposes" and he already had a mortgage on the house. 6 months after application and negotiations, JK accepts a reduction of $60,000, couldn't work out where $30,000 of his money had gone to. Missed summer business trading. Continuing at a monthly rate of average $5,900 at that rate at 5 years the loan would cost $491,000 about the same as the loan amount $494,000. And that's an interest-only loan with fees charges and un-fixable miscalculations (THEFT). 2011: La Trobe sold JK's property that he bought for $765,000 for $530,000 (loan amount plus agents fees) leaves no equity for JK. La Trobe tried to make JK pay them another $54,000, which they say he still owes them. 2013: JK went to Financial credit Ombudsman, nothing JK said was dealt with or looked at. All JK got was "La Trobe is a professional company and can do no wrong." JK ended up with nothing, living in his car on Newstart allowance, (still on it now) eventually JK bought a caravan from the tip for $150, and that is still his home. JK believes La Trobe owe him the equity and assets (approx total $500K) he had when he bought the house... plus interest. Also the social loss and income loss he has experienced because of them. The property JK lost to La Trobe is worth about 1.6 million now. La Trobe Theft and Fraud regulators won't look at. LA: John, what sort of loan did La Trobe demand you have for your house purchase? LA: Did La Trobe charge you $90,000 in exit fees just to change the mortgage security? LA: Did you complain and get $60,000 paid back but still lost $27,000? LA: When you missed a payment and were put in default, how much was the late payment fee? LA: Did Latrobe increase your interest only loan by adding a series of fees such that you would pay them the full value of the loan within 5 years? JK: Yes and I still had the full $494,000 to pay off. LA: Did La Trobe sell your property $230,000 under the price you bought it for? LA: Did La Trobe try to make you pay them another $58,000 claiming it as a shortfall? LA: When you went to the Financial credit Ombudsman, did they look at your case? JK: No, they just said "La Trobe are a professional company and can do no wrong." LA: What is the property worth today that you lost? LA: Have you ended up with nothing, living on Newstart allowance, and camping in a $150 caravan you got from the tip? LA: Has the royal commission addressed a case like yours in the hearings so far? JK: No and there are hundreds if not thousands of us who need to be heard not just read about by the royal commission. 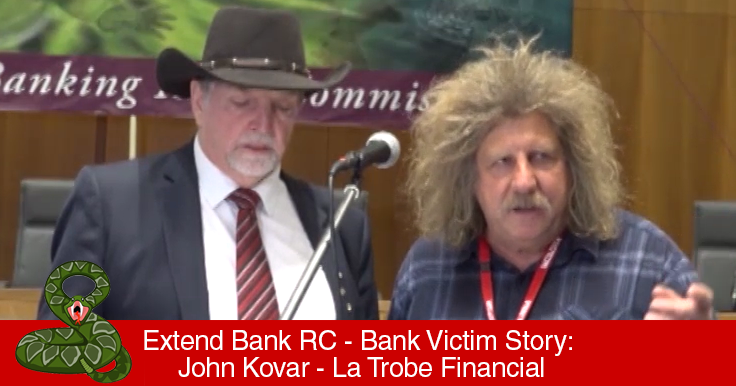 John's story is a classic example of why the Banking and Financial Services Royal Commission needs to be extended. This type of case is under-represented. There needs to be thorough investigation by an extended RC with the power to set in place recommendations for the compensation of individual bank victims and access to affordable and meaningful justice.